The Store for Used Cell Phones in Mesa! When you want to buy a new cell phone, but don’t want to pay the exorbitant prices you’d have to pay at a cell phone store or at the mall, you do have some other options. 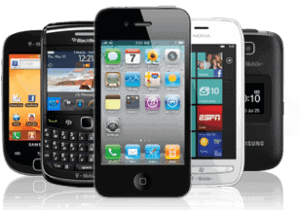 One of those options is to drop by our used cell phone store in Mesa, Arizona, and browse through our huge inventory of used cell phones. These are all in great working condition, and because they aren’t brand new items, we can offer them to you at rock bottom prices, so you can enjoy the benefits of a phone that’s just like new, without having to get stuck for the price of a new phone. No matter what kind of phone you favor, chances are we have several of them on hand for you to choose from – you may even find exactly the color you’re looking for! In our extensive supply of gently used/pre-owned cell phones, you’ll find models made by Blackberry, Sprint, Verizon, AT&T, T-Mobile, Samsung, Nokia, Apple, Motorola, LG, and more. You may find cell phones that are in slightly better operational condition at a new phone kiosk in your local mall, but you won’t find a better deal on a good working phone anywhere in the area. If you happen to live anywhere in the region around Chandler, Tempe, Mesa, Apache Junction, hurry down to the best used and pre-owned cell phone store Mesa has to offer, and take advantage of all the great deals we can offer you on quality cell phones. Our used cell phone store in Mesa, Arizona is very accessible to all these locations and even more towns and cities nearby, and we’ll do our best to make it worth your while to check us out before going to any other cell phone retailer. We can also help you if you are on the flip side of that coin, and you are ready to sell your cell phone because you’re ready to purchase the newest model being issued by your provider. Rather than just tossing your old phone on the scrap heap and sending it to the cell phone graveyard, why not convert your old device into instant cash, and earn some money that you can apply toward your new phone? We have experts in-house who can accurately assess the value of your old phone, and we’ll give you more than any other pawn shop in the area, because we want your business, and we want to have you become one of our repeat customers. Whenever you’re ready to buy, sell, or upgrade your cell phone, think of our used cell phone store in Mesa, Arizona, and come talk with us before you do anything else. We feel confident that you’ll be glad you came to us first, where you’ll get the maximum value for your cell phone.